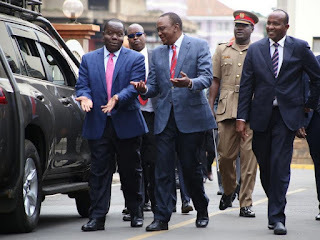 Thursday August 16, 2018 - President Uhuru Kenyatta left mourners in stitches on Wednesday during the requiem mass of former Cabinet Minister, Dr Henry Obwocha. During the mass at Holy Family Basilica, Nairobi, Uhuru described Obwocha as a loyal civil servant who was dedicated and serious when serving the public. Uhuru praised Nyamira County as the home of 'dedicated fellows' picking Interior CS Fred Matiang'i as the example in his administration. “Once you trust them, you will just sit pretty and wait for something to happen,” he said as mourners burst into laughter. “It is a sad moment for the entire country,” Uhuru added. Other notable Kenyans who come from Nyamira County include Chief Justice David Maraga.